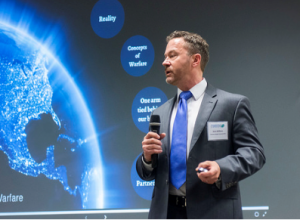 (Knoxville, TN) June 28, 2018: Protection Strategies Incorporated (PSI) President and Chief Executive Officer (CEO) Sean P. Williams delivered his briefing titled “Cyber Security: War in the Fifth Domain” at The Energy Technology and Environmental Business Association (ETEBA) Members’ Meeting. His presentation highlighted the shift to the new battlefront beyond air, land, sea, and space. Cyberspace, now seen as the “Fifth Domain” has presented us a new challenge on the battlefront. Mr. Williams stated: “The internet was designed for convenience and reliability, not security. Yet in wiring together the globe, it has merged the garden and the wilderness. No passport is required in cyberspace. And although police/governments are constrained by national borders, criminals roam freely. Enemy states are no longer on the other side of the ocean, but just behind the firewall.” Mr. Williams took questions and provided some answers on how we as a business community can change the dialogue on how to better protect ourselves in this new domain. He provided some solutions, mainly on how to be less reliant on government solutions and more prepared with use of imagination and public-private partnerships that will deliver solutions in a faster, more effective resolution to all end-users who use the internet, or are reliable on goods and means of life that are connected to the internet. Mr. Williams was also invited to present aspects of this briefing at the 2018 Tennessee Valley Corridor Summit in Oak Ridge, TN.